Saul is executive director and co-founder of North Cascades Institute. 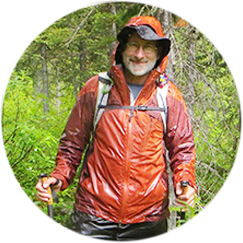 He is an ecologist, naturalist and writer who has explored the mountains and rivers of the Pacific Northwest for more than 30 years. Saul worked throughout the Northwest as a field biologist, fire lookout, commercial fisherman and National Park Service climbing ranger before starting the Institute in 1986. He authored From the Mountains to the Sea, North Cascades: The Story behind the Scenery, Teaching for Wilderness, and Living with Mountains. Saul serves on the board of directors of the Association of Nature Center Administrators, the Natural History Network, and the Environmental Education Association of Washington. He is adjunct faculty at Huxley College of the Environment at Western Washington University. Saul and his family live near the shores of the Salish Sea in Bellingham, Washington.